PNAS International Auction was once comparable to a red carpet premiere “ala Hollywood” where professional numismatist, antique collectors, society people, politicians, and other known personalities gathered, traded, and exhibited their collections. We had a Dr. Legarda who served as our ambassador and curator during which our collections received and awarded with exceptional recognition. Our chroniclers like Aldo Basso and Dr. Bantug whom if not for their keen observations, curiosities, and passion to share their knowledge to the public, we could have lost that part of history we are entitled of. And the so-called “Silent Majority” whom has rather chosen to shy away from the limelight but continuously supported the organization by other efficient means. The PNAS that once stood as the bastion of information and its members held hoards of collection far from the imagination of present day numismatist. During the term of Senator Manahan as PNAS president, there were more than 700 regular active members. Regular membership meetings featuring lectures on numismatics and auctions on choice coins were started during his term. His last year in office saw the revival of by the Central Bank of the Philippines of a program, abandoned in 1908 by the American authorities, to strike “proof coins”. The program gained momentum during the term of his successors, then writer Dr. Angelita G. Legarda (1975 – 1978), when even gold coinage were struck by the Central Bank. The holding of the “national conventions,” an extravaganza that include bourses, exhibitions, and auctions was also initiated, and were usually held at then luxurious Manila Hotel. The society doubtless gained impetus from the Central Bank’s numismatic program, and especially from the establishment of its Money Museum in 1974. The museum’s quarterly, The Barilla, has virtually been adopted by the PNAS, Dr. Legarda, as numismatic consultant of the Central Bank, made the Barilla not only an outstanding publication in itself but also a “lifeline” among the PNAS members. The ranks of numismatically-conscious Filipinos have greatly increased during that time. 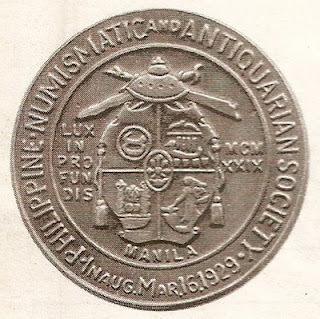 The Philippines as one of the only few countries of the world that have rich numismatic past. The Pre-Spanish Filipinos utilized a complex coinage system based on cast pieces of gold of different weights. The Spaniards, on the other hand, brought myriad of types of coins from their South American colonies. In the latter part of the Spanish regime, gold, silver, and copper coins were struck in Manila. The American regime had its own coinage, from colonial to Commonwealth period, not to mention several attractive issues of banknotes. Even the Japanese occupation gave birth to the “guerilla notes,” unrivaled elsewhere for sheer number and variety. And now, the Central Bank, which operates its own Mint, is making the Republic series of coins and currency really a wide-ranging aggregation. Next year, the organization will be celebrating its 80th year anniversary. From one of the largest organization in Asia with over 1000 members, the membership have dramatically decreased in the past years. And today, the question remains, does it fulfill the dreams of the founding fathers that the organization should become an instrument for exploring, preserving, appreciating and learning that part of our country’s cultural riches which consist of its numismatic past?